I always love Domino magazine, but this month's issue is especially divine. They've gone dark! And oh so elegant. Jenna Lyons, J.Crew's creative director, graces the cover and much of the inside. She, too, it turns out, is a tremendous fan of chalkboard paint. 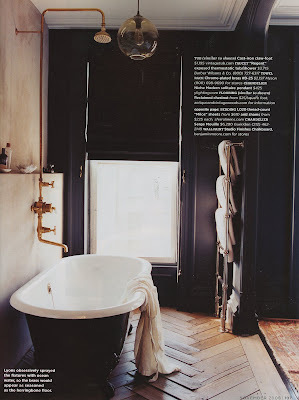 (That's one of the bathrooms in her Brooklyn brownstone below -- look at those rough herringbone floors!). 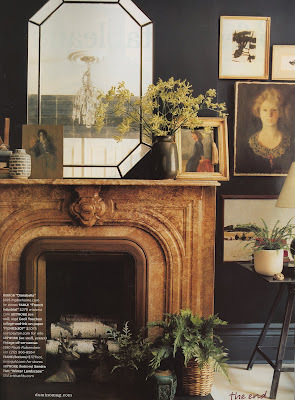 While I certainly obsess over black walls, the truly exciting part of the issue is their section on blogs -- it includes me (as one of the Traditional Glam pack along with Style Court, Peak of Chic and Heather Clawson's lovely Habitually Chic). Thanks so much Domino! 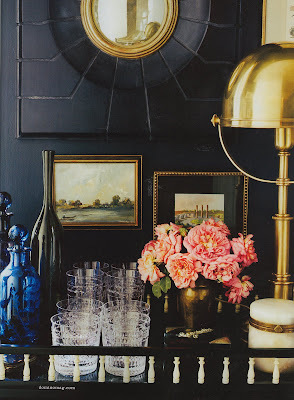 i love love love that you obsess over black walls. congratulations hollister (and courtney and jennifer)!!! Love your site.So rich and dark and mysterious. I never knew that black could look so good. It's true that domino Nov.2008 issue is truely exciting, backed with lots of informative info. and products. By the way Hollister I found you. I've been mooning over those herringbone floors ever since I got this issue! You have great elegant but masculine style. Yes, this domino spread was right on the mark...I couldn't stop looking at it.